Tumors are not merely masses of neoplastic cells but complex tissues composed of cellular and noncellular elements. This review provides recent data on the main components of a dynamic system, such as carcinoma associated fibroblasts that change the extracellular matrix (ECM) topology, induce stemness and promote metastasis-initiating cells. Altered production and characteristics of collagen, hyaluronan and other ECM proteins induce increased matrix stiffness. Stiffness along with tumor growth-induced solid stress and increased interstitial fluid pressure contribute to tumor progression and therapy resistance. Second, the role of immune cells, cytokines and chemokines is outlined. We discuss other noncellular characteristics of the tumor microenvironment such as hypoxia and extracellular pH in relation to neoangiogenesis. Overall, full understanding of the events driving the interactions between tumor cells and their environment is of crucial importance in overcoming treatment resistance and improving patient outcome. Tumor progression is partly a result of evolving crosstalk between different cell types within the tumor and its surrounding supportive tissue or tumor stroma . Invasive tumor cells interact with the microenvironment and remodel it into a milieu supportive of tumor growth and tumor progression. The altered environment is recognizable under light microscope as desmoplasia and this is used for assessing invasion . The importance of the microenvironment in tumor progression is shown using model systems. It has been shown on animal xenografts that injection of purified malignant epithelial cells results in the formation of histologically complex tumors, with 80% of the cells being stromal . Further, injection of non-transformed mammary epithelial cells into irradiated mammary stromal fat pads, resulted in increased tumor growth compared to those injected into contralateral, non-irradiated mammary fat pads. Irradiated stromal cells altered the microenvironment and this resulted in tumor promotion . Genetic alterations that initiate carcinoma, occur in the epithelium but events that promote tumor progression involve the stroma. In some cases, the trigger for neoplastic progression is speculated to come from signals within the stromal microenvironment . Cancer cells release stroma-modulating growth factors such as fibroblast growth factor, members of the VEGF family, PDGF, EGFR ligands, interleukins, colony-stimulating factors, transforming growth factor β and many others . These factors act in a paracrine manner, disrupt normal tissue homeostasis, resulting in stromal reactions such as angiogenesis and the inflammatory response [7, 8]. Carcinoma associated fibroblasts (CAF) are believed to influence tumor behavior and outcome and thus knowledge of their biology is of importance to an overall understanding of cancer. CAFs are large, spindle-shaped mesenchymal cells that share characteristics with smooth muscle cells and fibroblasts . They constitute a significant component of the stroma and represent the cells responsible for the change of extracellular matrix composition into one with increased amounts of collagens (desmoplastic response) . Currently, no precise definition of CAFs exists because of the different cellular origin and markers expressed: CAFs are likely to derive from resident fibroblasts and marrow-derived mesenchymal precursor cells, whereas their generation through epithelial-mesenchymal transition (EMT) of tumor cells is more controversial [6, 9, 10]. CAFs are not only phenotypically but also functionally distinct from their normal counterparts and are identified immunocyto-/histochemically based on different markers such as α-smooth muscle actin (α-SMA), vimentin, desmin, fibroblast specific protein −1, PDGFR α and β, and fibroblast activation protein or their combinations; CAFs generally lose caveolin 1, PTEN, p21, or have mutated TP53 [11, 12]. Some of these differences are reversible, whereas others persist when the fibroblasts are removed from the vicinity of the carcinoma cells. Their gene expression differences are due to epigenetic and genetic alterations [13, 14] and relate to the stage of their differentiation . The evidence above shows that CAFs, like tumor cells, are heterogenous, not only between different but also within the same type of cancer. CAFs promote tumor progression in several ways such as secretion of multiple factors and MMPs, inducing stemness, EMT, epigenetic changes, etc. [11, 16]. Recent breast cancer gene expression profiles of the stromal compartment, have revealed significantly different gene sets than normal mammary stroma, with increased cytokines, ECM molecules and proteases [17, 18]. They alter the three dimensional ECM scaffold and support tumor cells that eventually metastasize and activate immune cells to enhance the ECM-degrading capacity . Secreted ECM components such as tenascin reveal pro-migratory activity . TGF-β induces HGF expression by fibroblasts and also induces the transition of fibroblasts to myofibroblasts by increasing α-SMA and tenascin C expression . Gene expression changes, reported by Rajski et al., , which were induced by IGF-I in human breast fibroblasts, contained several soluble factors, such as periostin which is involved in bone metastasis and angiogenesis [23–25], tenascin, which enhances tumor cell proliferation , as well as LOXL1, a member of the lysyl oxidase family. LOXL1 like LOXL2, may act in the vicinity of epithelial cells during tissue remodeling and collagen cross-linking. LOXL2 has been reported to be involved in invasiveness  and specifically expressed by fibroblasts in tumor tissue . The presence of these factors indicates that the IGF-I activated stroma enhances proliferation and the metastatic potential of the cancer cells. In this sense, periostin and tenascin C also activate developmental pathways for the viability of metastasis-initiating cells in the lungs . In the pulmonary parenchyma, TGF-β3 stimulates myofibroblasts to produce periostin which binds stromal Wnt factors Wnt1 and Wnt3a for presentation to stem-like metastasis-initiating cells . Myofibroblasts and the cancer cells themselves also produce tenascin C which promotes the intracellular functioning of the Wnt and Notch pathways . The Wnt pathway is known to control stem cell maintenance in a variety of tissues  and tumors [32, 30, 33, 34]. We previously identified another cancer associated extracellular matrix protein, asporin which may interact with the Wnt pathway [35–38]. Asporin was also identified as one of the most CAF-enriched molecules using gene ontology analysis and further suggested as a possible EMT marker due to colocalization with ZEB1 both in the stroma and epithelium of prostate cancer . In breast and prostate carcinomas, mutations of critical tumor suppressor genes like PTEN and TP53 have been reported to occur in either epithelial or stromal cells in a mutually exclusive fashion [40, 41]. Such findings indicate establishment of a vicious circle, in which mutations in the carcinoma drive alterations in the stroma that again promote carcinoma progression [40, 41]. According to Dudley et al. , breast CAFs possess a nonmutated but functionally deficient form of p53 and TP53 mutation status may be a predictor of CAF-mediated chemoresistance . The role of CAFs in chemo/endocrine and target resistance is well-reviewed in Mao et al. using breast cancer as example. Besides the genetic mechanisms described above, there is also evidence supporting the involvement of epigenetic changes in the cancer stroma as a contributor to cancer progression. These include histone modifications and alterations in the expression of DNA methyltransferases, chromatin modifying factors and microRNAs . Direct contact between stromal and tumor cells allows minor populations of the latter to evade chemotherapy. For example, adhesion of melanoma cells to fibroblast monolayers through N-cadherin activates AKT, which blocks BAD and significantly reduces the cytotoxic effects of the chemotherapy drug, cisplatin . In summary, CAFs play a critical role in determining many aspects of tumor behavior and overall outcome. Cancer initiation and progression are largely dependent on the physical and chemical features of the adjacent environment particularly matrix topology (architecture) and stiffness. These features are determined by the size of biopolymer (proteins, proteoglycans and glycosaminoglycans) fibers and the density of the fiber network . Connective tissue is characterized by different fiber arrangements ranging from loose or random to highly aligned structures. ECM topology can provide important regulation of cell motility through physical cues that geometrically constrain adhesion sites to guide directional migration . Cancer cells display aligning behavior, called contact guidance through which they actively remodel the ECM fibers surrounding a tumor, using contractile force to align the fibers perpendicularly to the tumor [47, 45]. Dense fibrous collagen that is characteristic of breast cancer stroma forms radial patterns extending away from tumors . On the other hand, the reticular orientation of the collagen matrix surrounding mammary glands may anchor and/or restrain cells. Thus, non-linear matrix reduces invasion while linear structure promotes it (reviewed in ). Matrix concentration and post-translational modifications such as glycosylation and cross-linking (e.g. by LOXL1 and LOXL2) affect the mechanical properties, including visco-elasticity or stiffness (reviewed in ). Tumors are stiffer than their normal adjacent tissue. For example, healthy mammary gland is highly compliant (elastic modulus E = ~200 Pa), while the average tumor is over an order of magnitude stiffer (E = ~4,000 Pa). Both the tumor-surrounding stroma and vasculature exhibit increased stiffness (E = ~800–1,000 Pa and ~450 Pa, respectively) . Increased matrix stiffness is also observed in fibrotic lungs, scar tissue and irradiated or aged tissue . ECM topology and stiffness can influence mechanosensing and activate intracellular signaling to promote directional cell migration. Integrin receptors and the physical arrangement of adhesions could trigger orientation of the cytoskeleton, and matrix orientation can also stabilize leading edge protrusions to promote directionally persistent migration in which specific signaling pathways (via vinculin, talin, FAK, p130CAS and filamin A) are involved [45, 46]. Cancer cells recognize an increase in ECM stiffness and respond by generating increased traction forces on their surroundings by regulating focal adhesion formation and growth factor signaling. For this purpose, the cell has several options: it can either force the network fibers apart and remodel the shape until it can pass through the pore, or tumor cell degrades the fiber matrix with the help of proteolytic enzymes (reviewed in ). This in turn, enhances growth, survival, and invasion of tumor cells by promoting focal adhesion maturation and signaling through actomyosin contractility . Increased tumor tissue stiffness has been linked to tumor progression, direct stem cell differentiation, cell–cell and cell–matrix adhesion, hyaluronan synthesis, and expression of genes that play important roles in invasion and metastasis [52–54]. Another important tumor characteristic is growth-induced solid stress (Figure 1). As tumor cells proliferate they sequentially create new solid material (i.e. cells and matrix components) which pushes against the surrounding tumor microenvironment. In normal tissue, the expansion of the tumor microenvironment is resisted by the enclosing microenvironment. 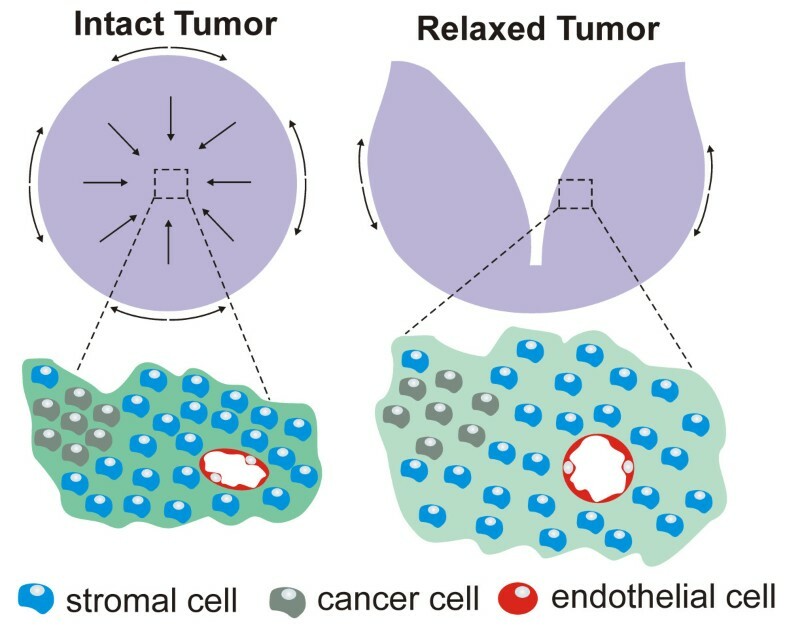 However, cancer cells proliferate uncontrollably, ignoring contact inhibition and their expansion imposes elastic strain on the surrounding tumor microenvironment, storing stress through the deformation of compliant structures and collapsing more fragile structures, such as blood and lymphatic vessels (Figure 1). Interestingly, this solid stress is accumulated within the tumor and maintained even after the tumor is excised . The known contribution of the ECM to solid stress includes both collagen and hyaluronan. Collagen resists tensile stress because it becomes stiffer as it is stretched. This finding is true for both capsular and interstitial collagen because the ECM in tumors is extensively cross-linked. Whereas hyaluronan resists compression, its negatively charged chains repel, owing to electrostatic repulsion and trap water, forming a poorly compressible matrix . The compression of vessels by solid stress creates two potential barriers to drug delivery. First, the collapse of blood vessels hinders access of systemically administered drugs. This collapse might explain, in part, the fact that tumors with more ECM might be more resistant to treatment. For instance, pancreatic ductal adenocarcinomas, chondrosarcomas, and chordomas are rich in ECM and refractory to chemotherapy [56–58]. Second, the lack of lymphatic vessel function reduces drainage, leading to uniformly elevated interstitial fluid pressure (please see below). As a result, the transport of therapeutics, like antibodies and nanoparticles, is reduced because the dominant means of transport becomes diffusion which is a very slow process for large particles and macromolecules . In this sense, decreasing solid stress by the inexpensive angiotensin inhibitor, losartan, enhances drug delivery and potentiates chemotherapy by decompressing tumor blood vessels . Schematic of the biomechanical forces in the tumor microenvironment. As tumor cells proliferate they sequentially create new solid material (i.e. cells and matrix components) which generate radial and circumferential solid stresses. In the tumor center, circumferential and radial stresses are compressive while in the periphery, radial stress is compressive and circumferential stress is tensile (direction indicated with arrows). Compressive stresses in the tumor interior squeeze tumor components, including lymphatic and blood vessels (note compressed lumen of blood vessel and high density of cells and extracellular matrix in dark green). After the tumor is cut and the stresses are released, the tumor interior decompresses (note extended lumen of blood vessel, relaxed cells and extracellular matrix in light green). Reproduced and modified with permission from Prof. Rakesh K. Jain . Besides endothelial cells and fibroblasts, the tumor microenvironment also harbors innate and adaptive immune cells. It is a complex and highly dynamic system that should concomitantly work to eradicate a tumor. However, once a system is deformed, immunity becomes a benefit for the tumor and provides a very important cue to its development and progression . The tumor-promoting effect of chronic inflammation has been reported many times [62, 63]. However, how tumors promote inflammation and engage inflammatory cells in this process, is still being intensively studied. Macrophage density in the tumor generally negatively correlates with relapse-free and overall survival but localization also seems to be important. The association between TAM (tumor associated macrophage)-density and survival of cancer patients depends on the intratumoral or peritumoral macrophages counted . TAMs promote the metastatic capacity of cancer cells in stromal or perivascular areas, while around the necrosis, in a hypoxic state, they stimulate angiogenesis . A fibroblast secreted protein-1 (FSP1), also called S100A4 and mts1, is secreted by both fibroblasts and cancer cells, and also possibly by macrophages , making the environment more favourable to tumor progression by regulating inflammation and angiogenesis and promoting metastasis [66, 67]. FSP1 is proangiogenic, possibly mediated either by the activation of plasminogen or through the transcriptional up-regulation of MMP13 . Both of these proteinases play a role in endothelial cell invasion . Immune cells, particularly macrophages and neutrophils are sources of chemokines, growth factors and proteases, as well as DNA-damaging reactive oxygen and nitrogen species. The gene expression profile of macrophages isolated from malignant tumors significantly differs from wound or resting peritoneal macrophage profile, with increased number of proliferation-associated genes . Chemokines are produced not only by activated macrophages but by stromal and even cancer cells themselves. As an example, CXCL12 activates CXCR4 both on the surface of immune cells and on hematopoetic and endothelial precursors. The receptor is also expressed in some cancer cells. Accordingly, CXCL12 has several consequences: i) attraction of immune cells leading to tissue destruction, favoring invasion and metastasis; ii) promotion of growth and survival of cancer cells expressing the CXCR4 receptor; iii) recruitment of precursor cells for vasculogenesis; iv) activation of CXCR4 may also lead to greatly increased production of TNFα which itself exhibits other effects. Inflammatory cytokines, overexpressed by tumor cells recruit monocytes (macrophages), lymphocytes and neutrophils to tumor stroma, where they release VEGF, HGF, metalloproteinase 2 and interleukin 8 which affect endothelial cells and contribute to tumor progression . Up-regulation of tumor-regulated interleukins 6 and1β is also associated with the inflammatory network, tumorigenesis, angiogenesis, and metastasis in breast, prostate, and pancreatic cancers . Breast CAFs initiate and mediate tumorigenesis through a macrophage-recruitment inflammatory signature and is dependent on NF-kB signaling . Recent studies demonstrate that colony stimulating factor (CSF)-1 which represents the main growth and differentiation factor for macrophages is overexpressed in breast, ovarian and prostate cancers . Granulocyte CSF and granulocyte-macrophage CSF also contribute to progression of various cancers through recruitment of monocytes, macrophages and neutrophils into the tumor vicinity (reviewed in [6, 73, 74]). Tumor angiogenesis is an important factor in proliferation, metastasis, and drug sensitivity. Primary tumors without vasculature are small and dormant, while the growth of the tumor mass creates hypoxic conditions in the center of the tumor that induce expression of VEGF and subsequent tumor vascularization . CAFs are also suggested to be an important source for growth factors and cytokines recruiting endothelial cells. These are involved in the establishment of the cancer stem cell niche and metastatic spread of tumor cells into distant organs . Angiogenesis in malignant tumors, as measured by microvessel density correlates with clinicopathological factors or poor survival in many cancer types (reviewed in ). Tumor-endothelial cell interactions are mediated mostly by cell surface adhesion molecules (i.e. integrins, cadherins, immunoglobulins and selectins) [78, 79]. CD34, CD31, and factor-VIII-related antigen are commonly used as tumor endothelial cell markers and microvessel density is determined by immunodetection of blood vessels with these markers. However, the markers identify not only neovessels but also pre-existing large ones . Nestin has recently received attention as a marker of newly formed endothelial cells [81, 82] and seems promising in the evaluation of neoangiogenesis of different tumors. Hypoxia is also characteristic of abnormal tumor microenvironment that is intrinsically linked to the formation of neovasculature and is clinically associated with metastasis and poor patient outcome [83, 84]. Diffusion-limited hypoxia is a consequence of tumor cells that are distant from the vascular supply. Such cells are exposed to prolonged or chronic hypoxia and tumor cells are viable in such environments for hours or a few days [85, 86]. Hypoxia induces oncogene expression, enhances DNA mutation rate, and selects for cells with increased apoptotic thresholds [83, 87]. Hypoxia drives tumor progression through increased matrix deposition, cross-linking and remodeling and, enhances collagen turnover and its fibril deposition . Hypoxia-inducible factor (HIF)-1α plays an integral role in the body’s response to low oxygen. It is one of the primary genes involved in the homeostatic process which can increase vascularization in hypoxic areas. HIF-1α allows for survival and proliferation of cancer cells due to its angiogenic properties and its inhibition prevents the spread of cancer . Many of the responses implicated in resistance to anti-angiogenic therapy may be mediated by HIF-1α activated genes . The well-described inducers of EMT, Snail, Slug and Twist are themselves induced by hypoxia . Hypoxia may also affect stem cells , and studies on this particular subpopulation of cells in tumors would be relevant to the metastatic process as cells surviving under hypoxic conditions become aggressive and pluripotent. Development of novel hypoxia-targeted therapies include bioreductive prodrugs, HIF-1 targeting, and genetic engineering of anaerobic bacteria . Low extracellular pH is another consequence of the abnormal metabolism in the tumor and supportive factor for its progression. Products of anaerobic glycolysis - lactic acid and carbonic acid (produced by carbonic anhydrase from CO2 and H2O), are the known sources of H + ions in tumors [94, 95]. The imbalance between increased production of H + ions and their reduced removal, lowers the extracellular pH in tumors. The mean pH profiles also decrease in tumors with increasing distance from nearest blood vessels. Low extracellular pH causes stress-induced alteration of gene expression, including the upregulation of VEGF and IL-8 in tumor cells in vitro. Coordinated study of pH, pO2, and VEGF expression in vivo indicated that in low pH or oxygenated regions, tissue pH, but not pO2, regulates VEGF promoter activity. Conversely, in hypoxic or neutral pH regions, tissue pO2 and not pH regulates VEGF expression . Tissue pO2 and pH appear to regulate VEGF transcription in tumors independently. These data suggest that these key microenvironmental parameters in solid tumors regulate angiogenic factors in a complementary manner. Another feature of the pathophysiology of the tumor microenvironment, is elevated interstitial fluid pressure (IFP) ranging from 10 to 100 mmHg [98, 99] while IFP of normal tissue is around zero . It is thought that the tumor vasculature is the driving force in increasing tumor IFP [101, 102]. In contrast to normal vasculature which is characterized by dichotomous branching, tumor vasculature is unorganized and has trifurcations and branches with uneven diameters. Large inter-endothelial junctions, increased numbers of fenestrations, vesicles and vesico-vacuolar channels and a lack of normal basement membrane are often found in tumor vessels . Due to ultrastructural alterations in the tumor vessel wall, vascular permeability in solid tumors is generally higher than that in various normal tissues . Tumors also lack lymphatic vessels or the intratumoral vessels are non-functional [104, 105] and as a result, excess fluid accumulates in the interstitium, extending the elastic ECM and elevating IFP. Using the model of IFP regulation Heldin et al. showed that fibroblasts actively regulate the tension applied to the ECM through integrins which enable them to exert or modify tension on the collagen fibre network, thereby modulating the elasticity of the ECM in response to hyaluronan and proteoglycan expansion . According to Oldberg et al. , inflammatory processes in carcinomas promote synthesis of collagen binding proteoglycan fibromodulin by stroma cells, leading to the formation of a dense and stiff collagen scaffold and a high IFP. Interstitial fluid pressure may have important clinical implications with regard to cancer therapy. Roh et al. reported an inverse relationship between tumor IFP and tissue oxygenation and hypothesized that IFP may aid in predicting the efficacy of radiation therapy. Elevated tumor IFP can also act as a barrier to delivery of therapeutic agents, thereby reducing their efficacy. In this sense, multiple studies have demonstrated improved uptake of chemotherapeutic drugs following a reduction in tumor IFP [60, 59, 109, 110]. Interactions during which the tumor creates a microenvironment favourable for proliferation, for the recruitment of new blood vessels, and for the stimulation of the production of proteases that can degrade adjacent tissues, increase the likelihood of tumor development and invasion. Growing evidence points towards a key role of the multiple cellular and noncellular components of the tumor microenvironment such as cancer associated fibroblasts, immune and endothelial cells as well as matrix topology and stiffness, interstitial fluid pressure, growth induced solid stress, hypoxia and extracellular pH. Full understanding of all the events driving the interaction of tumor cells with their environment is of crucial importance in overcoming treatment resistance and in better patient outcome. This work was supported in part by grants NT13573 from the Czech Ministry of Health and NPU I LO1304 from the Czech Ministry of Education. DS was also supported by LF_2014_003. GK conceived the idea, did literature search and drafted the manuscript; DS did literature search and contributed in drafting the manuscript; MG, NN and KB were involved in discussion and drafting the manuscript; JB supervised the project, made substantial contributions to the concept and design of manuscript, and drafted the manuscript. All authors read and approved the final manuscript.